EYELIDS: Excess skin covering the upper eyelids was removed. LOWER EYELIDS: Fatty protrusions causing lower eyelid bags were also removed. PATIENT 2: This patient underwent open brow lift and upper blepharoplasty. The brows were positioned at a higher level and excess skin in the upper eyelids was removed. PATIENT 3: This patient underwent an open brow lift and upper eyelid lift (blepharoplasty). Nose reshaping (rhinoplasty) was performed at the same time. PATIENT 4: Lateral brow lift (temporal lift) was performed in this patient through a short incision hidden behind the hair line. Brow fixation was re-enforced using an absorbable Endotine ribbon. 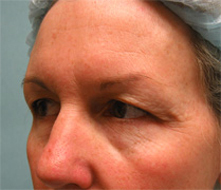 Upper blepharoplasty was performed at the same time to remove excess skin in the upper eyelids. PATIENT 5: This patient ]underwent an open brow lift and upper eyelid surgery (blepharoplasty). 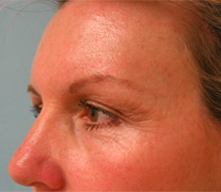 Forehead wrinkles were surgically treated to achieve a smooth appearing forehead. PATIENT 6: This patient underwent a lateral brow lift and upper blepharoplasty (upper eyelid surgery). The side aspect of the brow was lifted and excess skin in the upper eyelids was removed. PATIENT 7: This patient underwent upper and lower eyelid surgery. Nasal reshaping was performed at the same time. 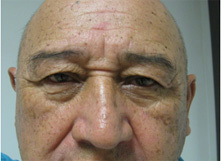 PATIENT 8: This patient underwent upper eyelids surgery (blepharoplasty) and lateral brow lift. PATIENT 10: Lower eyelid blepharoplasty was performed. Protruding fat (bags) and excess skin was removed. PATIENT 11: This patient underwent an open brow lift and upper eyelid skin excision surgery (blepharoplasty). PATIENT 13. This patient underwent Asian eyelid surgery also know as Asian double eyelid surgery. A natural appearing crease was surgically created in the upper eyelid. This procedure is done under local analgesia. 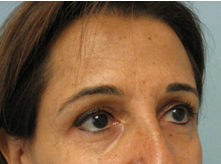 This patient underwent a lateral brow lift and upper eyelid lift (blepharoplasty). PATIENT 15. 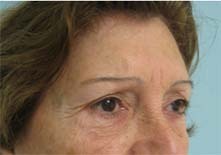 Lateral brow lift surgery. PATIENT 17. 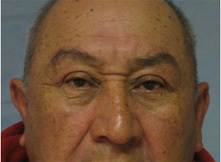 This patient underwent lower eyelid surgery (blepharoplasty). PATIENT 18. 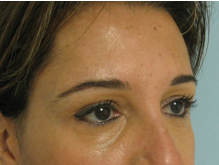 This patient under went a transconjuctival removal of fat (bags) and fat grafting to the lower eyelid grooves. Incisions are placed behind the lower eyelids. No external scars present. PATIENT 19 . 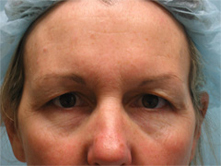 This patient underwent upper and lower blepharoplasty. Skin excess in upper and lower eyelids was removed. Fatty protrusions in the lower eyelids were removed and fat grafting to the grooves were performed. PATIENT 20 . 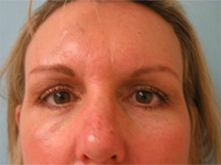 This patient underwent a lateral brow lift and upper eyelid lift. PATIENT 21 . 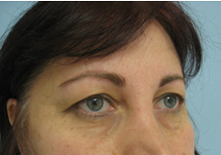 This patient underwent a lateral brow lift (outer sides of brows were lifted). PATIENT 22. Upper eyelid lift. Excess skin in the upper eyelids was removed. PATIENT 23. This patient complained of sad appearing eyes. 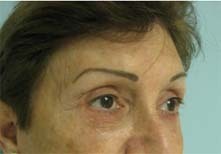 A lateral brow lift was performed to improve brow position, which in turn dimished a tired or sad look. PATIENT 24. 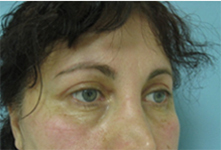 Upper eyelid skin excess was excised to open up the patient’s eyelids preserving a natural look. PATIENT 25. Lateral brow lift and upper eyelid surgery.